From small groups of hunter-gathers living off the land and foraging berries and other edible plants, agriculture, a type of applied biology, evolved to domestication and cultivation of crops. This active involvement originated at different times and places, and to various extents based on environmental conditions: archeological evidence suggests its origin dated from the end of the Ice Age, as early as 14,500 to 12,000 years ago. The earliest agricultural successes coexisting with the rise of great ancient civilizations appeared in major river valleys where the annual river flooding not only provided water but also a consistent source of silt, a natural fertilizer. These included the birthplace of agriculture in the Fertile Crescent between the Tigris and Euphrates Rivers in Mesopotamia and the Nile in Egypt; Indus in India; and the Huang in China. Explanations for the adoption of agriculture and its consequences vary: Some experts contend that it was intended to meet the increasing food needs in ever-burgeoning populations, needs that could not be satisfied by food gathering or hunting. Alternatively, agriculture may not have originated in response to food scarcity but rather that the population in a given area increased significantly only after stable sources of food had been established. Evidence supporting each has been adduced. Whereas in the Americas, villages sprang up after the development of crops, villages and towns in Europe appeared earlier than or at the same time as agricultural advances. Agricultural success depended not only upon the whims of nature providing favorable climatic conditions but also upon the ability of early farmers to utilize irrigation, crop rotation, fertilizers, and domestication—the conscious selection of developing plants whose characteristics increased their utility. Tools intended for the simple acquisition of wild foods were replaced by those for production, such as the plow and those powered by animals. The earliest domesticated crops include rye, wheat, and figs in the Middle East; rice and millet in China; wheat and some legumes in the Indus Valley; maize, potatoes, tomatoes, pepper, squash, and beans in the Americas; and wheat and barley in Europe. SEE ALSO: Wheat: The Staff of Life (c. 11,000 BCE), Domestication of Animals (c. 10,000 BCE), Rice Cultivation (c. 7000 BCE), Botany (c. 320 BCE), Artificial Selection (Selective Breeding) (1760), Green Revolution (1945), Genetically Modified Crops (1982). The National Grange of the Order of Patrons of Husbandry, an association of farmers, was founded in the United States in 1867 to promote community wellness and agriculture. 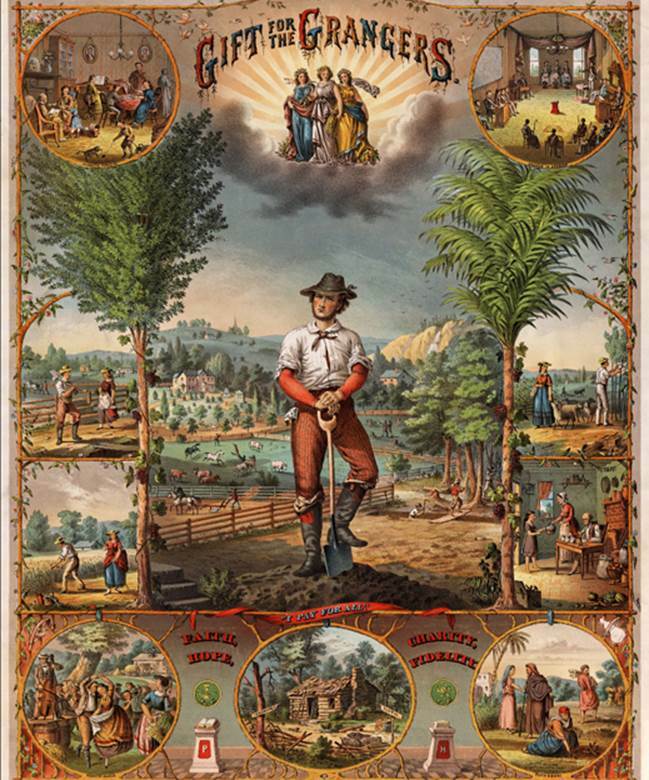 This 1873 poster, “Gift for the Grangers,” promotes the organization through idyllic scenes of farm life. In 1870, 70–80 percent of the US population was employed in agriculture; by 2008, this number had dwindled to only 2–3 percent.